Mehdi Salah at le Prado Bowl in Marseille. isTia: What is the best and the worst thing about Marseille? Mehdi Salah: I love my hometown! Marseille has a very good side: the climate, the beaches, the skateparks .... But the big drawback is the FOOT! (note of the translation: the soccer) This is the local sport! We eat soccer all day long... Not to mention the neighborhood that is paralyzed every night there is a game or the mentality of some fans .... That’s a big con. On the other hand, the pro is that we still manage to make a difference as people. Marseille is an open city that starts each year very new and interesting challenges. At skateboarding level, we try to ask the city more and more, so that the infrastructure evolves for the best. isTia: Are there skate parks near where you live? Mehdi Salah: I live near the Bowl du Prado but there are other spots rather cool, the bowl of Valmente, La Caverne it’s a DIY skatepark, the skatepark of La Friche, the Palais De La Glisse (indoor and paying it but I'm going to the Vert). 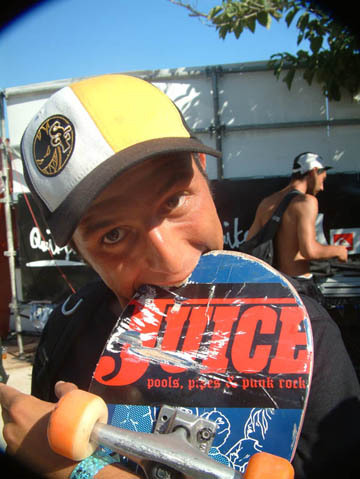 Then regarding backyard skateboarding, we are very fortunate to have the big House Of Happiness at Bruno Rouland’s and also a kind of pool built in the 80's, a very scary hole or well: the Holenite Pool. isTia: If you would move, where would you live? Mehdi Salah: I had a big crush on a trip to Haleiwa, Hawaii for its atmosphere, its waves, its park "Banzai" and shave ice! But if I had to go far, likely I'd like to go live in Orange County. isTia: How did you come to skate? Mehdi Salah: I discovered skateboarding at the age of 8 years old with my brother. At this time it was only street skating. Then in 1991 the Bowl du Prado was built and we all got into the Bowl and left the street. isTia: How many years of skateboarding: Mehdi Salah: ... I stopped counting ... but over 20! isTia: What are your early influences in skating? Mehdi Salah: I had just seen the video Street On Fire and I wanted to do the same thing; then the local skaters inspired me a lot. isTia: Someone else in your family that skates? Mehdi Salah: No ... but my baby already looks very interested! 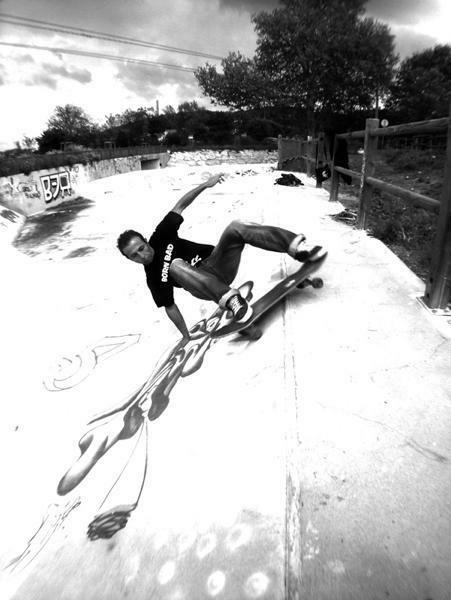 isTia: Local skaters who inspired you? Mehdi Salah: Older Stephane André, Toto Gali and his brother at the time and Alex Giraud and Julien Benoliel, Bruno Rouland and more recently Jean Postec in vert. isTia: Let's talk about your participation in skateboarding competitions. - How many contest skate did you participate? Many .... I could not tell! - Is it important to go to contest? I do not think the important thing is to skate and to share good sessions with the homies! - What was your best contest? My best memory is the Quiksilver Bowlrider on my hometown of Marseille. Many pro skaters landed for a week (Cardiel, Speyer, Ben Krahn, Brian Patch, Omar Hassan and many others ...) It was the annual local event, we were super happy to skate with them. During the event we would never left the Bowl. - What was your worst contest? The multi-sports contests for mainstream public where in general the music is horrible and the announcer yells all the day. isTia: How many contests abroad? Mehdi Salah: Very recently, the World Cup Bowl Brixlegg in Austria and the Euro contest of Basel in Switzerland. isTia: How did you qualify to go to the Orange contest in Marseille on June 23? Mehdi Salah: It is an event invitation only. isTia: How do you train for the Cup of Orange? Mehdi Salah: No special training, I go for fun first. isTia: Since the Massilia Cup, what were your Cup results in the past? Mehdi Salah: The results of the competitions, I do not hold long term, I just know that last year I finished 10 th. Since Massilia Cup, It's the same contest even if it was labeled World Cup Skateboarding (WCS) last year. This is the third edition this year. Since Quiksilver does not organize any more Bowlrider the idea was to remake an international contest of the same scale. isTia: Is it different now that the WCS is organizing the contest? Mehdi Salah: There are simply more skaters that are coming from abroad, which is a good thing. isTia: What is the French level in bowl-Vert-park-ramp is? Mehdi Salah: There is a very good level for those who practice Bowl. In Marseille, the bowl has nearly 25 years of existence and it has helped generations of kids that are better and better. It's nice to see this! isTia: Is there a Vert-bowl-ramp-park scene in France or is it an American specialty? Mehdi Salah: Actually there are more and more bowls in France. However, there are often small projects and many skateparks that are not made by legit companies so the money that is being spent is wasted because the parks are not that good. There is not even one park with a pool in France which is unthinkable... This is some kind of an outrage and it pushes us to DIY. isTia: Is there a difference between the bowl skaters and street skaters? Mehdi Salah: Yes, as everywhere I think. In France a large majority is doing street, a minority are riding bowls and a handful are vert skaters, that’s the big picture. isTia: Is there a vert scene in France? Mehdi Salah: There is a micro vert scene that is developing. It will explode when we have more structure. isTia: There are no empty swimming pools in France, as there are in California. The empty swimming pools; that make you dream? Mehdi Salah: Yes, it actually makes me dream. I spent several years driving to find empty swimming pools around my area, it was an obsession. Once, my friend Crap called me to tell me he had found a pool at a hotel that would be destroyed. We have a good session there. You can see the video on dailymotion: "A Day In My Secret Pool". isTia: Are websites like Ozzie’s Blue Tile, Broken Magazine or Istia important? Mehdi Salah: Those sites are excellent. They help relay the information and get news from everywhere. I also receive quite a bit of news via Facebook. isTia: What are other important web-sites? Mehdi Salah: Internationally: Juice, Confusion. At home: Soma and Beach Brother. isTia: Websites that you like ? Mehdi Salah: I'm going from site to site, without preferences. isTia: You wrote a couple of articles for Broken Magazine. Do you regularly write skate reviews? Mehdi Salah: If I remember correctly, we were several friends who wrote. It was for our DIY “La Caverne”. This was a group project; we worked several years in an old shed in a downtrodden Guarigue, to build our spot. isTia: Do you surf? Mehdi Salah: I have been surfing since I'm fifteen, I am less than a regular surfer but I like the vibrations of the ocean. isTia: Favorite music? Mehdi Salah: Punk rock. isTia: Roundwall of Flatwall ? Mehdi Salah: Just gimme a Wall! isTia: Wheel size? Durometer? Mehdi Salah: 56/58 99 duro generally Spitfire. isTia: Sponsors: Mehdi Salah: Vans Skate and Witchcraft. I skate for the Vans family team, to summarize: we are friend, we have the same delirium, we are older now, but we all have always the same passion for skateboarding and that's why Vans is still here for us. I turned pro with Vans when Alex Van Doren was team manager, he wanted a guy who skated curves. At that time I had already skated for Globe for 10 years and I knew it would no longer evolve. I thanked Globe for all they had done for me and I went with Vans. I just needed to change and the very strong image of Vans suited me. isTia: Besides skateboarding, what do you enjoy doing in your spare time? Mehdi Salah: I love to travel, surf, chilling with my friends and my family ... take care of my daughter Rose (6 months). isTia: Who are your main competitors? Mehdi Salah: No competitors! Only just friends and homies with whom we share the same passion. isTia: Who are your favorite skaters? Mehdi Salah: John Cardiel, Chris Miller, Darren Navarette. isTia: What is your favorite surface? Mehdi Salah: The wood for the vert and concrete bowls for "concrete therapy! " isTia: Where do you like skateboarding? Mehdi Salah: In good parks: Marseille, Washinton Street, Cave, Irun ... I loved skater at Cholo's. The skatepark I ride most are: the Bowl du Prado. For the vert part, I go with my friend Bruno (Rouland). isTia: Do you use pads in the pool bowl? Mehdi Salah: No. I thinks it is not really useful and it is a matter of habit, I just use pads in vert. isTia: Do you skate in empty backyard pools? Mehdi Salah: Yes! I skated in France one empty swimming pool (the hotel). That’s because most of our pools (in France) are square and very few homes or neighborhoods are abandoned ... Otherwise when I go to Hawaii, my friend Ethan Lau took me a real skater pool in a subdivision of Honolulu. It was really crazy ... I was finally in the video! isTia: What are your favorite skate videos? Mehdi Salah: Fruit of the vine. isTia: How much time do you spend each day to skate? Mehdi Salah: It is not defined in advance. Skateboarding is a free expression and not really training. I like to do it just to please me and be with “colleagues”! isTia: What about the French Skateboarding Federation? Mehdi Salah: It's quite complicated skateboarding is managed by the Federation of Rollers, then there is a Skateboard National Committee. There do the best they can but I think the budget does not follow. They organize the French Skateboard Championships in street and big bowl. Many skaters do not end up in there ... It's just a big mess. 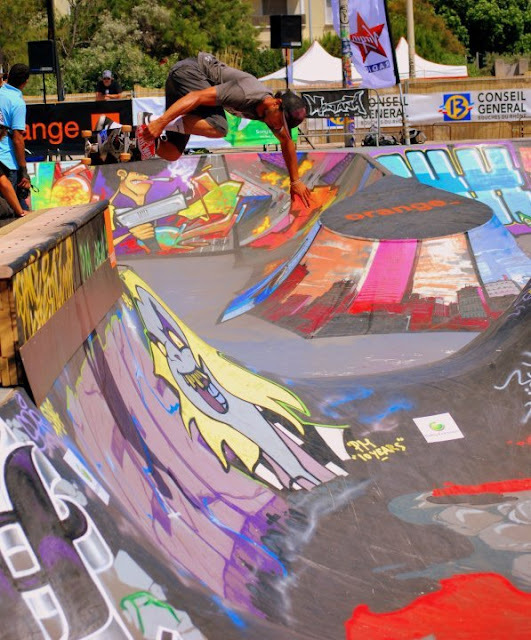 isTia: Should there be a skate Federation skate in France or is it impossible to manage? Mehdi Salah: I think it is possible to have our own Skateboard Federation (Apart from the Rollers). A lillte bit of willingness would suffice and be willing to roll up the sleeves a little. At worst the Skateboard should be with the federation of surfing or snowboarding but with the federation of roller, that is really impossible ... It does not work at all. isTia: Can one be pro in France and make a living with the skate? Mehdi Salah: Yes there are some pro in France who manage to live their passion but it's still difficult. Marseille, a great experience. And earlier this week I was asked to help with the walls at the Orange Freestyle Cup in the Bowl du Prado. isTia: Is skateboarding and graffiti going hand in hand? Not really for me. last year in vert. I wanted to do bodyjart, I did an extreme hangup that I projected in front flip and I landed directly in the flat. I got out with a slight fracture of the femoral. As far as I’m concerned, I was very lucky! isTia: Until now, what were some of the highlights of your career as a skater? Mehdi Salah: I do not remember one in particular, I have a multitude. Skateboarding is a daily activity for me. The skate is part of my life, every day I skate I can have the best memories of my life. isTia: Do you have a special diet? Mehdi Salah: Yes I am a vegetarian by conviction and for animal liberation. isTia: Can you tell me what " La Caverne " is? La Caverne is our DIY spot built during several years in an old shed on the hills of Marseille. We wanted to create our own spot. We started by just doing a curve, then we wanted a wall, we made two, then after that we added a craddle and then we never stopped until the local residents block access . To reach the spot you have to walk 20 minutes to the hill, so you’d better be motivated. isTia: Another thing we forget to talk and we're missing? Mehdi Salah: Our association POWERSLIDE, we offer courses and events to give the kids a good taste of the skate. isTia: Thanks: Mehdi Salah: Famix and the homies, Macs Millan, my sponsors (Julien Bachelier, Antiz Witchcraft, Loic Benoit and Vans) and thank you to isTia! Thanks a lot Mehdi for taking the time to answer all those questions and good luck at the Orange Cup! Thanks to Christophe Corso for sending me Mehdi's pictures.